International Talk Like a Pirate Day: What’s your cat’s pirate name? Arrr! Shiver me timbers, it’s International Talk Like a Pirate Day! To celebrate we’ve put together a fun guide for finding out what your furry Purrst Mate’s pirate name is. Are they a Captain Jolly Mogwash, or maybe a Matey Long Fang Feathersword? 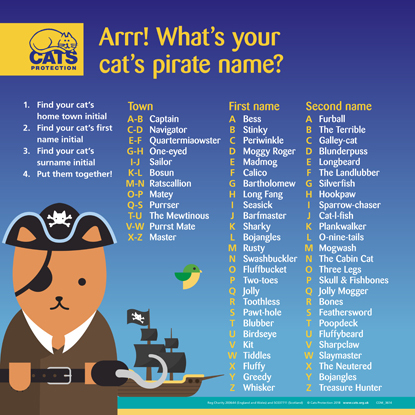 Don’t forget to let us know what your swashbuckling moggy’s name is in the comments below or on Facebook or Twitter!